Hillary Clinton Wellesley commencement speech: Robert Pinsky on the politician’s 1969 breakthrough. 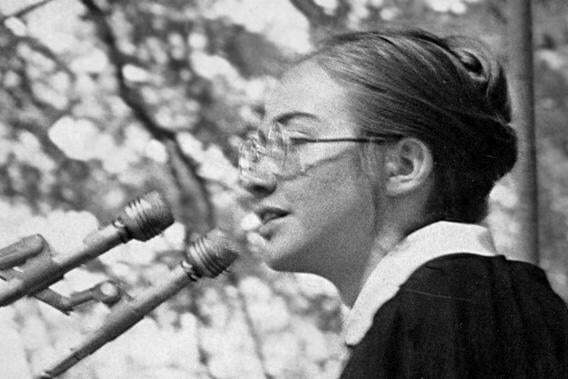 Hillary Rodham’s 1969 commencement speech, and the young poetry professor who saw it. Hillary Rodham speaks at Wellesley College in 1969. In politics as in show business, certain public figures attract meanings beyond reason. Often, at the generating core of that vague penumbra of guesswork and exaggeration, lurks a blunt, explicit question, like: “What is a modern woman?” The cloud emanated by such a crude, hidden core is tangential to the person’s actual character and work. Something like that pervades what may be a culminating stage—running for president, or not—for Hillary Rodham Clinton. I use the full three names advisedly. I first noticed her when she was Hillary Rodham, well before she met Bill Clinton. It was 1969, at Wellesley College, where Hillary was a senior and I was a freshman professor teaching poetry classes. The famous commencement address she gave that year was the beginning of her story as a national figure—but even before then, she was already the object of speculation and the bright light to which theories flew. Wellesley was not an easy fit for me. Decidedly nonpreppy, I had never been to Massachusetts before the interview. I had not attended an Ivy League school nor a prep school— not even a summer camp. In the first batch of mail on my desk was a formal letter from the trustees of Wellesley College announcing that they had voted to approve a change in the college charter, removing a passage that declared Wellesley faculty would be composed of Christian men and women. Impossible for me not mutter an ironic, secular-Jewish “Just in time.” Plus, I was a man. Like the students, I was in my 20s, but in some ways they were more confidently at home on that campus than I was. It was in a poetry writing workshop that I first heard the name, pronounced with a peculiar—and it turns out prophetic—complexity of countertones: envy and superiority, something that was close to awe and something else that was not quite disdain: “Hillary Rodham!” said a pretty young woman with long hair—just the name—and the other pretty young women with long hair nodded and murmured their recognition. In the same group, memorably, someone had presented a poem mentioning a lawyer. As the discussion rambled, somebody said, looking around at her fellow poets for confirmation: “Nobody here would marry a lawyer!” … and no one in the group disagreed. Ha. Even at the time, I must have been a little skeptical of their solidarity, suspected that many in the room would become lawyers, marry lawyers, divorce lawyers to marry other lawyers, deliver babies who would grow up to become lawyers. But in the political and cultural vapor of that year and that place, it was No lawyers (or lawyers’ wives) here! Hillary must have already been accepted to Yale Law School by then. Possibly an unacknowledged or suppressed understanding that she was ahead of them on a track they denied, but would follow, underlay the scornful yet impressed way my students pronounced their classmate’s name. Maybe those poets, would-be hippies, and wannabe radicals had a sneaking, subconscious thought that Hillary’s way of being a woman was magnetic, predictive, and (pardon the expression) correct? In fairness to those poetry students, their forms of rebellion, however misty or fashionable, had also affected—had even formed—Hillary Rodham, the onetime Goldwater Girl from Illinois. I never taught Hillary nor did I meet her in those years. (Decades later, as first lady, she helped foster the Favorite Poem Project; in 1998, she and President Clinton took part in a Favorite Poem reading in the White House.) But I did get to see the young Hillary in action—unforgettably—at the Wellesley College commencement. The speaker at my graduation from Rutgers was Adlai Stevenson. Sad to say, I don’t remember anything he said. At Stanford, my wife’s commencement speaker was Warren Burger. I was there, but of what the chief justice had to say I remember nothing. But I do remember that on May 31, 1969, at Wellesley, I saw a gifted, electrifying natural in action, calling for something better than what we had. For some people the event has become legendary. Many others may never have heard of it. The commencement speaker was U.S. Sen. Edward Brooke. Brooke was— now here’s a period detail—a Republican moderate. Smooth, handsome, a World War II combat veteran, he was also the first African-American popularly elected to the United States Senate. He co-authored the Fair Housing Act, and he was actively pro-choice. In other words, with the eyes of 2013, Brooke can be seen as a heroic fantasy of courage and wisdom. In the eyes of 1969, he was seen as blandly complacent. It was the radical spirit of 1969 that led Wellesley’s administrators to invite a student speaker, an unprecedented move. Wellesley by tradition had no valedictorian. One alumna said, “Many of us are still recovering from the shock” of having a student speaker, as Judith Martin (Wellesley ‘59), also known as Miss Manners, reported in her Washington Post piece about attending the event. His phrase “coercive protest” was a clever speechwriter’s attempt to characterize the widespread student demonstrations (and other demonstrations) of the time—clever but horribly deficient in relation to the voter registration efforts in Mississippi, which had led to murder and police criminality. Brooke seemed to be averting his eyes from American forces napalming villages and defoliating forests in Vietnam, and from the violent disorder in segregated American cities. After the recent years of assassinations, urban riots, demonstrations, and student strikes, the words “coercive protest” were pusillanimous. Hillary Rodham came to the microphone and explained to the assembly of seniors, families, alumnae, faculty, trustees, and reporters that before her prepared remarks she would respond briefly to Brooke. What I recall vividly about her impromptu remarks is less what the 21-year-old student politician had to say than the shrewdly controlled way she formulated her objection to Brooke’s performance. How could somebody so young have improvised a devastatingly courteous, even courtly critique of the senatorial bromides? I remember a rhetoric of respectful regret, along the lines of: “Senator, we hoped you might have said something about conditions in our cities,” and “Senator, we need you to speak about the escalation of war in Southeast Asia.” She expressed sadness at her need to say that empathy was not enough, that she and the other students needed Brooke’s guidance, not empty generalities. The “art of the possible” was not enough. Brooke had mentioned as good news that the percentage of Americans below the poverty line had decreased to 13.3 percent. “That’s a percentage” she said, with polite disdain. Her remarks worked, though the present Hillary Clinton might wince at young Hillary’s scorn for percentages, her telling the senator he owed his audience something better than “a lot of rhetoric.” The poise, good manners, and fearless cogency of those improvised remarks gave them not just rhetorical power, but authority. Hillary Rodham’s speech—the first ever given by a graduating senior at Wellesley—was interrupted by frequent applause and followed by a standing ovation that lasted (says the Fitchburg Sentinel, confirming my memory) for seven minutes. For those of us who were there, this is pretty standard language of 1969. What was amazing, and not standard, was the gift for rising to an occasion: a political gift and a matter of talent surging toward its realization. As part of the prepared part of her speech, Hillary Rodham read a poem by a classmate, a composition also touchingly of that era. On that day in May, in other words, the notes that were struck may have been unremarkable, but the occasion was like hearing a very young, uniquely gifted musician play: something in the sheer, expressive command—a word used about athletes, as well as musicians—was extraordinary, unmistakable, and already formed. Those poetry students had their idea of what a woman was or would be in their generation. The founders of Wellesley College and the trustees who revised its charter in 1969 had their ideas. So too did the alumni who were shocked by the tradition-breaking student commencement speaker, or approving, or some of each. In some vague way, I must have had my own ideas about such matters. But whether or not Hillary Clinton runs for president in 2016, it was Hillary Rodham who pointed the way in 1969.